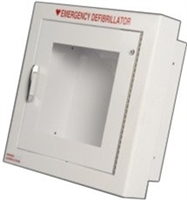 AED Cabinets - Wall mount AED cabinets with and without Alarm. Choose your AED cabinet size and options with or without an alarm or strobe. Our AED Cabinets fit most brands of Automated External Defibrillators, AED's. AED Cabinets- AED wall mounted enclosure cabinets to fit all sizes of AED's from all leading AED cabinet manufactures. We feature quality AED cabinets at the lowest prices online. Choose from our standard metal AED cabinet without an alarm to our featured AED cabinet with alarm and strobe. Our AED cabinets fit all leading brands of Automated External defibrillators from Philips, Heartsine, Defibtech, Cardiac Science, ZOLL and Physio-Control. Northwest Health and Safety Inc. is a leading provider of AED's and AED Accessories. For More information on AED cabinets or AED's visit us at AEDUniverse.com.